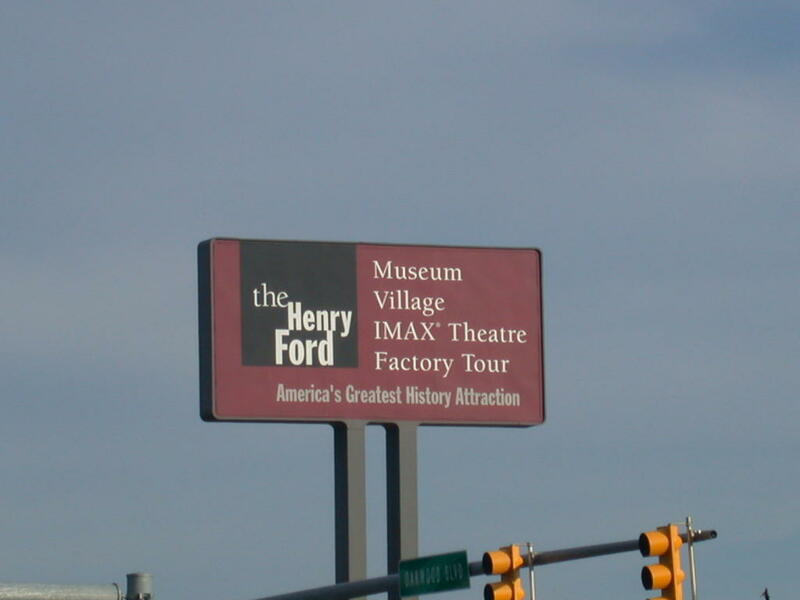 It’s been some years since I’d been to what used to be called the Henry Ford Museum and Greenfield Village. The name change makes sense once you’re there—they’ve branded the whole operation, with separate experiences with names. They should have gone one step further: instead of the subtitle “America’s greatest history attraction,” why not “attractions.” Bigger claim, and it suggests that it’s more than a museum. The big new show is about airplanes. It’s the most interesting design there: good figures, some of them outside the railings that protect the objects, breaking down the wall between history and visitors. (The same technique as “America on the Move” at the Smithsonian, done at the same time—clearly the new fad in manikin design!) Interactives pretty weak—a huge wasted space given to making and throwing a paper airplane. A few places to pose for pictures that might work (on bleachers watching airshow, as though you were on the wing of an airplane, sitting in various airplanes) but these mostly seemed deserted: mostly people were watching the video. No apparent overall message about airplane design or air travel—no overall message at all. It’s a series of small, well-told stories about particular airplanes. A vast improvement over the airplane parking lot, but not yet a history exhibit. Not so new, but new to me: the Dymaxion House. A gorgeous job of restoration, but it’s not clear to me why it’s there or what their point is. Is it there as technological gee-whiz, as a critique of the capitalist system in its dealings with inventors, as a clever gimmick, as a lost opportunity? You wait in line in an area that pretends to be the showroom for the Dymaxion House at the Beech aircraft factory, where it was made. (This is all fake, but you’re not told that.) You’re led through in small groups. My tour guide was as charismatic as could be, but slipped in and out of his roles as tour guide and salesman for the house, and it was hard to tell which was which. His basic line was that the evil bankers wouldn’t support the brilliant Buckminster Fuller—that the house would have been a great success if they had not been afraid of change. “Evil bankers” resonates badly at at place called “The Henry Ford,” and it’s basically misleading. The Dymaxion House was a hand-made, and could probably have never been mass-produced; the bankers were right. In going for the “great inventor” story they miss the more interesting business story. This is a common failing of technology museums. The Dymaxion House is a lost opportunity to explore a failed invention; by blaming the bankers they miss a chance to say something interesting about how invention becomes part of everyday life.